The 35 Poky Pedalers on yesterday’s Poky Pizza Pedal enjoyed a pleasant bike ride, some delicious pizza, and the company of a special mystery guest. These ingredients blended into a superb recipe for Bike Fun. Our train of Poky Pedalers on Prais St. Our special mystery guest, Dave Cieslewicz of the Wisconsin Bike Fed, is at the far left in the black shirt. We met as usual at Point Area Bicycle Service. Cool, cloudy skies suggested the possibility of a shower, but over the course of our Poky Pedal, the clouds dispersed leaving abundant sunshine for us to enjoy. Our 4-mile route on calm streets and non-motorized paths took us northeast past the UWSP DUC student center and the Goerke Park complex. We made it as far northeast as the corner of Frontenac Ave and Jordan Ln, at which point we started looping back towards our pizza destination. We enjoyed calm stretches of streets such as Prais St and Franklin St where our long train of Poky Pedalers rode through charming neighborhoods. After heading south on Third St and crossing CenterPoint Dr, we turned right into the recently-opened MSTC parking lot. A two-way route through that lot provides a new means of biking to and from the downtown Stevens Point public square without having to travel upon Main St, a one-way street that often feels uncomfortable for bicycling west and necessitates suboptimal (but legal) sidewalk riding for heading east. Clark St, the nearby eastbound one-way street, gets heavy traffic and is even less comfortable to bicycle on. We traveled west through the mostly vacant MSTC lot last night, but we observed how this route can provide a suitable eastbound route for bicycling from the square to Third St and then northbound to Portage St and other east-west streets north of downtown. Our pizza destination was Graffiti’s Sports Pub on the downtown square. 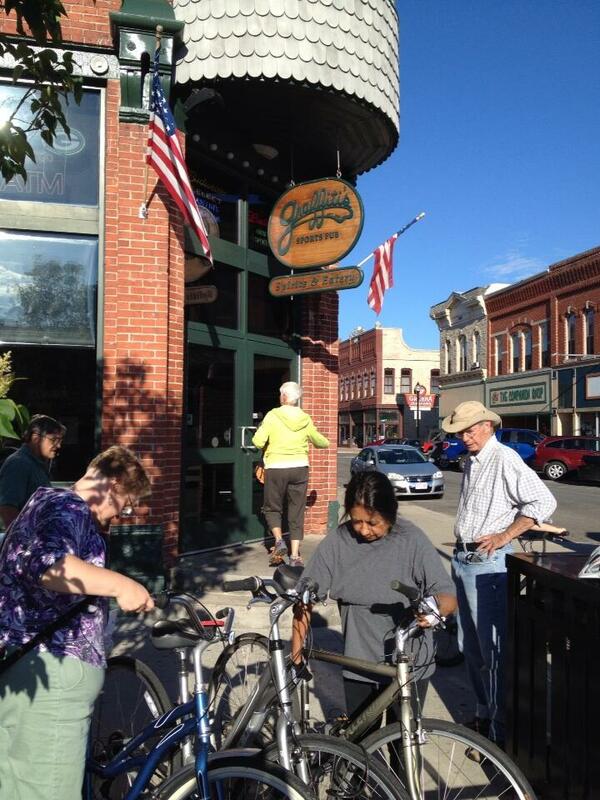 About 30 Poky Pedalers stayed to partake in food, drink, and conversation. The staff at Graffiti’s were exquisite in attending to our swarm of Poky Pedalers. I want to thank everyone at Graffiti’s for enriching our Bike Fun. Bike Fun was further amplified by the presence of a special mystery guest. We were joined by Dave Cieslewicz, Executive Director of the Wisconsin Bike Fed. 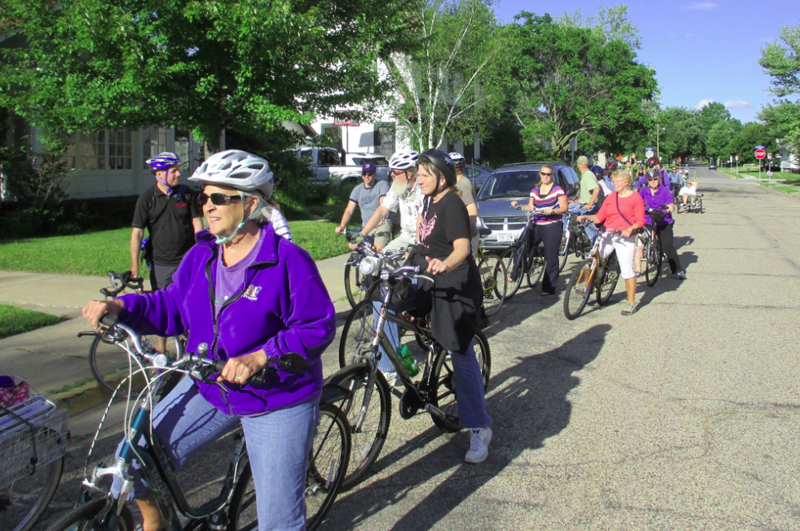 As they mention on their website, the Wisconsin Bike Fed is the country’s largest statewide bicycle organization working to make bicycling convenient, safe, accessible, and fun. It was a great honor to have Cieslewicz join our Poky Pedal as part of his visit to Stevens Point to learn about the state of bicycling here. During our ride, he was able to experience both highlights and challenges in our urban bicycle network. Cieslewicz chatted with Poky Pedalers, gaining insight into the domain of ordinary people in ordinary clothes riding ordinary bikes to ordinary places. At our pizza destination, he briefly spoke to us about the Wisconsin Bike Fed and its mission. I want to heartily thank Cieslewicz for making time in his busy schedule to learn about PPSP by sharing Bike Fun with us. Poky Pedalers don’t have to wait long for more Bike Fun. Check out the Upcoming Poky Pedals page and the 2014 Bike Fun Calendar to get the scoop on Bike Fun next week and beyond.